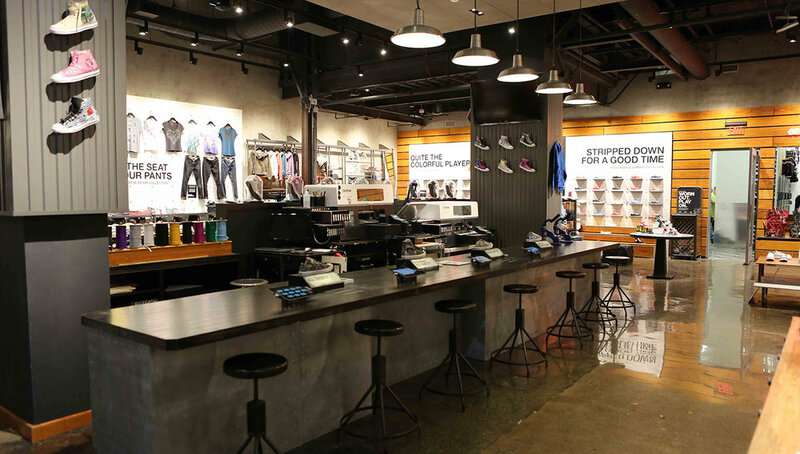 For this Garden State store we designed the first completely new storefront for Converse Retail. Hand patinated blackened steel panels define the thirty foot high and fifty foot wide façade. We also developed new brand signage featuring inch-thick edge-lit Lexan that casts a glow onto a recessed aluminum panel beyond. We resolved difficult site conditions and turned some of them into advantages. An expansion joint between two buildings runs through the middle of the site with different floor conditions, column structure, and deck heights – strategically suspending cement panels to create a unified appearance at the customization/ cashwrap zone, while preserving the open-system ceiling design, critical to the store’s feel elsewhere. We wrapped the doubled-up columns along the expansion joint in corrugated metal, creating a backdrop for customization’s video display.